ATOP is a Taiwanese manufacturer of industrial electronics. The company has been founded in early nineties of the 20th century. Their today's product portfolio hints at ATOP's focus on a few particular areas that receive the company's dedication, effort and resources, resulting in no-nonsense product innovation and a build-up of in-house know how. The apparent center of gravity lies in Ethernet switches, routers and "serial device servers" (aka "terminal servers" in ancient times). All of these are based on unified hardware platforms involving a switching matrix and/or an ARM CPU, possibly accompanied by further peripherials (UART's, wifi, WWAN radio). ATOP clearly leverages a common firmware code base and a proven mechanical design (in several basic form factors). ATOP apparently offers these HW platforms in an open fashion too, in the form of "industrial computers" with an ARM CPU and a preloaded Linux image - a corresponding build environment is available for application/service cross-compilation on a PC. support for IEEE1588 = PTP, practically in all the managed switches. Technically there's an E2E Transparent Clock implemented in hardware, and a "software-based" Boundary Clock is alternatively also possible. (One rackmount switch model still in development should be capable of a HW-based BC mode, should have a higher-quality oscillator for a longer hold-over in the Boundary Clock mode, should support telecom profiles with an optional SyncE. support for ring-based redundancy with a fast convergence is nowadays almost mandatory across the whole market of "industrial Ethernet" - yet even in this discipline ATOP is shining, supporting several protocols for ring redundancy. Also noteworthy is the five-year warranty on the whole portfolio. This hints at the vendor's confidence in the quality of its products: power supply design, thermal design and soldering. 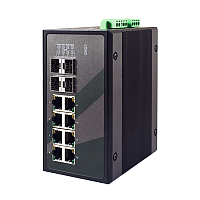 In terms of "scale", the ATOP portfolio of switches belongs to the segment of smaller "satellite" DIN-mounted switches and basic 24-port (+uplink bonus) rackmount switches for general industrial use. ATOP clearly and understandably does not aspire to the "midrange enterprise", campus, provider access/core/edge, carrier-grade or datacenter categories. Instead, ATOP offers a surprising set of useful features at the "industrial pole" of the application spectrum. In the following chapters, an overview of ATOP product categories follows, in descending order by uniqueness. This is a small group of products for use in "power substations" = in electric energy transmission and distribution. see the two links in the following paragraph, look for a tab called "compliance". 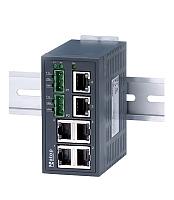 At the moment there are only two such products: EHG9508 and EHG-9512 = DIN-rail switches, 8-port and 12-port. The R&D are working on a rackmount model called the RHG95xx series, which should have a greater number of ports, all power input variants dual-redundant and independently isolated, and a quality HW implementation of the Boundary Clock, with support for "telecom profiles" - i.e. this machine won't be IEC61850-only. As far as dual-redundant and independently isolated power input is concerned, this alone is also available in existing RHG75xx/76xx families, for general industrial use, in 19"/1U form factor. 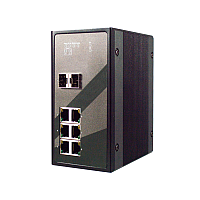 some 19" switches have 3 modular slots per 8 ports each, and the selection of modules includes a 4-port MACsec. With the smaller DIN-rail switches, the standard is obviously a dual power input passively joined by a double Graetz bridge, i.e. lacking mutual isolation between the input branches. It is a typical cheap solution, sufficient for many use cases. PoE is present as an optional feature in a large part of ATOP's switch portfolio - and it's strictly 802.3af/at compliant. Which means that also the Powered Device (a camera, wifi radio or some such) must be 802.3af/at compliant (passive splitters won't work). The managed PoE switch can be configured to turn the PoE power on or off per port, and reports per-port PoE status: apart from on/off it also measures the instantaneous voltage and current per port. In general it seems that ATOP prefers not to put an internal step-up DC/DC converter inside a switch, for 802.3af/at PoE. PoE switches by ATOP typically require an external supply of 48V nominal. Which has the advantage, that it no longer needs to be debated, how much power is available to the attached PoE Powered Devices, and what the switch thermals will look like as a consequence. With an external PSU, the switch will just feed them all and won't even break a sweat, as all the electric power will just "pass through the switch" without notable losses. Also, if several years down the road the external PoE PSU dies, it's just a commodity PSU, easily replaced, and the expensive switch lives on! In 19" PoE switches, there are even PSU variants, where the "switch core" has a dedicated (dual redundant) power input, side by side with a (dual redundant) 48V input for PoE = the nominal voltages of both power systems can be different, and incidents in PoE power do not endanger the switch core and management functionality. If you aim for maximum power to be available to the powered devices, consider tweaking the output voltage of the external PSU towards the upper tolerance limit of the standard and your PSU, i.e. 55 V or thereabouts. Many DIN-rail PSU's have a tweakable knob (bolt head) for this, next to the output terminals. The increase in voltage will allow for a lower current and will thus indirectly suppress the loss percentage a little, that occurs in contact resistances and in the CATx wiring's own resistance. This measure is even presumed in the tables of specified maximum power levels in the 802.3at spec. and most interestingly, the EMG series = several "watertight" IP67 models with M12 connectors in a massive die-cast Aluminum case. Including optional PoE! a nice selection of ordinary unmanaged DIN-rail switches in metallic or plastic cases.